So you're in the West Valley and have a thing for taxidermy and great Bloody Marys, huh? 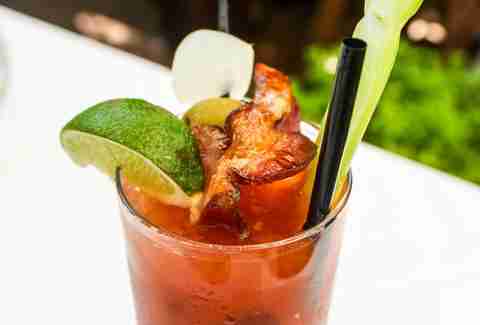 Well, Saddle Peak Lodge and its bacon Bloody Mary should have you covered. The Mary features a bacon-infused house-made mix with slightly smoky, slightly sweet flavors, all topped off with a maple-glazed strip of more bacon. Because, duh. 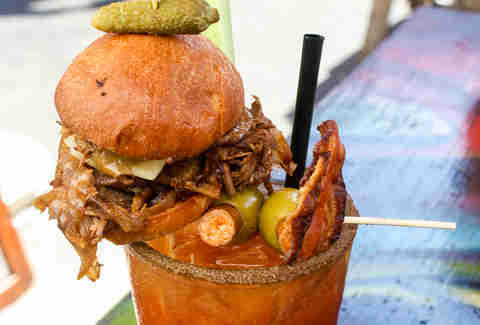 It might seem a little weird to have a build-your-own Bloody Mary on a list of the best Bloody Marys in LA (no offense to you), but it’ll feel less weird when you find out that you 1) get to pick your spirit here, and 2) choose from a variety of impressive Attic garnishes, like a pulled pork slider (wut) and Slim Jim-stuffed olives (WUT). 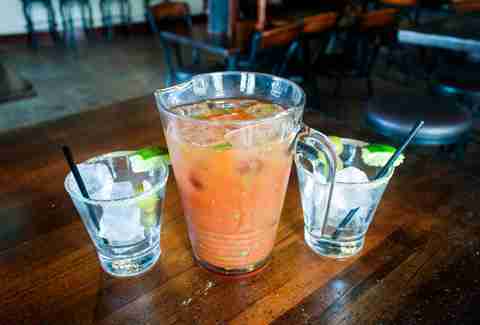 Because let's be honest, you're in this Bloody Mary thing for the hair of the dog, and Congregation Ale House has got pitchers, and that is many hairs, and many dogs. The light, cilantro-centric formula comes at $7.50 per... PITCHER. 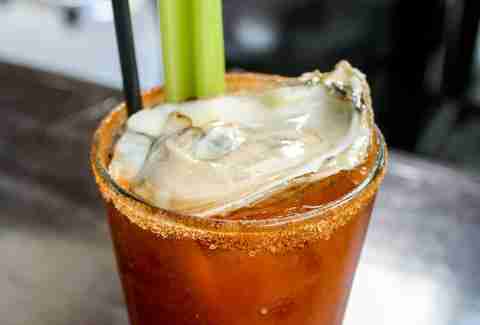 This new seafood shack in the Marina may have just started its brunch service, but its already got four vastly different Bloody Marys on offer. 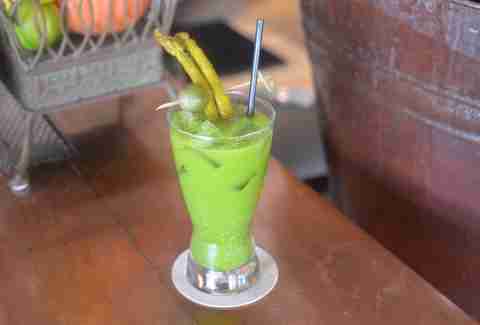 Check out the groundbreaking green version, adeptly named the Kale Mary. It’s made with roasted green tomatoes, tequila, kale/celery juice, and jalapeño. And even if you just totes came over to juice after your workout at the Equinox next door, this has kale in it, so it counts, right? Right. This Sunset spot with a great patio only does its Bloody on weekends, but it's worth dealing with parking for: the red monster's garnished with a Chartreuse-pickled egg and okra, bringing its deliciousness level to nine. Sub in gin for vodka, and you'll be at a solid 10. 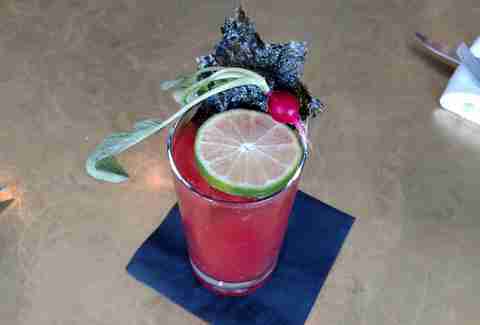 It's not enough that one of the best Bloody Marys in town can be found alongside Roy Choi's culinary ode to Hawaii. 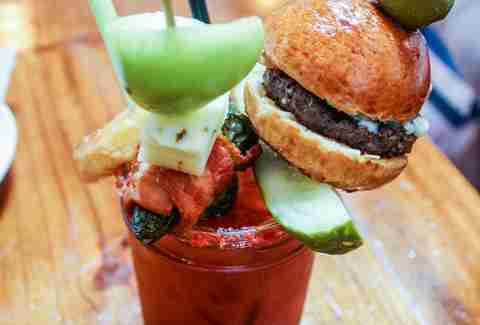 For a mere $15 with entree, you can make that thing (and all the other brunch cocktails) bottomless, too. The seasonally complex, salty rim makes it over-the-top and will have you licking your lips for more, which you’ll get, because, again: bottomless! 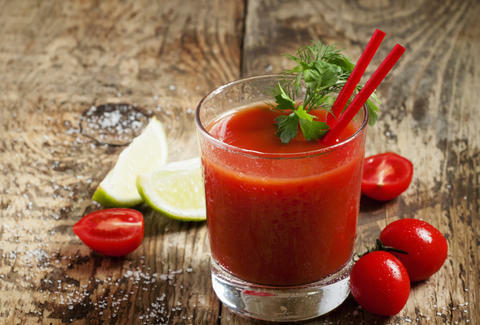 Fresh tomato juice made of a secret blend of roasted and raw tomatoes is just the start of this simple and awesome Bloody Mary, a vodka version which holds up to the fresh seafood fare offered at both locations. The Maryland spice blend makes for a perfect rim that's expressly Hungry Cat; go ahead, take home a jar for yourself. Because sometimes you just want a Bloody Mary at night, the classy Normandie Club's clarified version has all the flavor and none of the pulp, resulting in an extremely upscale version. Pinkies up, guys. Pinkies up. Two things to know about the Los Feliz favorite’s Bloody: 1) it uses a secret mix that blends eight ingredients (including fresh tomatoes -- duh -- and celery bitters), and 2) it's available all hours at both The Alcove and the adjacent Big Bar. When enjoyed on the outdoor patio with an entree of your choice, you basically win the citywide game of brunch. 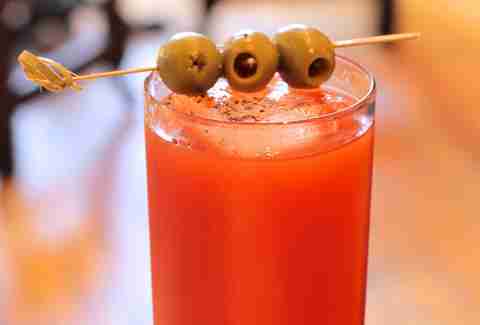 When you use clam juice instead of tomato juice, you've got a Bloody Caesar -- but that's not the only way Cadet's version bucks tradition: it also uses amontillado sherry, chili vinaigrette, white soy, and fish sauce for a savory-spicy flavor-bomb of a cocktail. The result is deliciously funky with just a hint of spice. 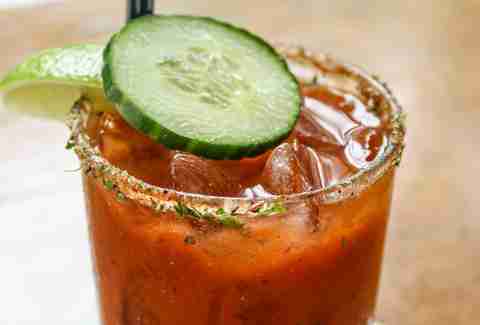 This Italian spot takes your Bloody Mary to the next, more Mexican-y level with mezcal, which results in a version that is savory, balanced, and pairs perfectly with all of the killer brunch items. Yes, you can pick your vodka at this Franklin Village gastropub, but you can also way more importantly choose your garnishes too, with options including a celery stalk, green olive, a pickle spear, bacon-wrapped avocado, pickled tomatillo, a fried onion ring, pepper Jack cheese, roasted Brussels sprouts, and even an English burger slider, which itself comes with a Dijon duck-fat aioli. Yet, somehow, this is still on the drink menu? Esther Tseng is a freelance food and drink writer and can be found tweeting and Instagramming a bunch of delicious food in Los Angeles and beyond at @estarLA.